Does your college have an Honor Code? Probably not. Few do. I graduated from Duke University which struggled to create an Honor Code. According to the current cover story by Scott Huler in the Duke Magazine for alumni, Duke had a difficult time establishing one. Its first code was created in 1993 - and is now being celebrated on its 25th anniversary. An earlier effort was attempted in 1965, but it lost among Duke women, who voted it down by a thumping 3-1 margin. When Terry Sanford, a former North Carolina governor, became president of Duke, he formed the President's Honor Council, which created the first code in 1993. However, the Duke Chronicle reported that cheating was increasing, rather than decreasing! In 1999 38% of students acknowledged they had copied material verbatim and had not even footnoted it; 37% said they'd falsified lab data, and a stunning 45% admitted to unauthorized collaboration. Then Duke President Nan Keohane did the honorable thing by reporting the scandalous lack of academic integrity. "I will not lie, cheat, or steal in my academic endeavors." "I will conduct myself honorably in all my endeavors." "I will act if the standard is compromised." authorities. One student, Jarrett Smith, concluded, "Personally, I feel like I should take some sort of measure" if he sees a misdeed. An Honor Council member stated, "We are so fortunate to be models of moral courage in an era when we need it." I checked with Susanne Wasiolek, Duke's Dean of Students, to learn how many honor code cases there were in a year (which is called the Duke Community Standard). She reported that in 2015-16, in a university with 6,449 undergraduates, 170 people were charged with cheating, 128 of whom were found to be guilty. For example, of 32 reported plagiarisms, 28 students were found guilty. Of 11 students charged with lying, 8 were found responsible. The result was that six students were expelled, 15 suspended for one semester, while others were suspended for two semesters, three semesters, and two were suspended for 5 semesters. How does Duke's experience compare with other university Honor Codes? Washington & Lee, with 2,200 students, traces its Honor Code to Gen. Robert E. Lee, who was the President of what was then Washington College, from 1865-1870. He asserted, "We have but one rule - that every student must be a gentleman." As earlier version of the Honor System dates back to the 1840s. Lee took deliberate steps to encourage students to take responsibility for their own conduct, based on Lee's belief that "as a general principle you should not force young men to do their duty, but let them do it voluntarily and thereby develop their characters." 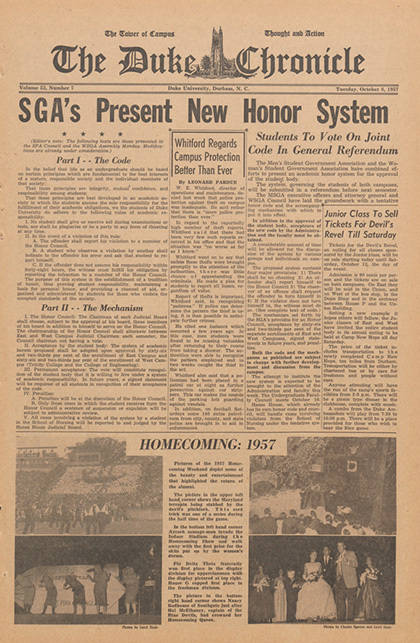 In 1905 the student body assumed direct control of the Honor System by forming the Executive Committee of the Student Body. The system is entirely self-regulated by the student body, with no faculty or board of trustees oversight. Those found guilty of violating the community's trust are asked to leave the University. Professors confidently offer unproctored or self-scheduled exams. My son, John, who was a student, had his missing wallet returned to him twice with no money missing! As a Washington Post headline put it in 2012: "Washington and Lee's honor system: the real deal." The number of investigations to date in an academic year. The number of withdrawals while being investigated. The number of withdrawals in the face of a closed hearing. Elizabeth Mugo, President of the Executive Committee of the Student Body, told me that in a recent year there were 12 investigations, which led some students to withdraw from the university. Five students went to a closed hearing, half of whom were found to be guilty. Finally, the University of Virginia's Honor Code reported that on a campus of 23,000 students, there were 50 reported violations. Most of these students accepted an "Informed Retraction," in which they agreed to a two semester suspension. Very few insisted on a formal hearing, one of whom was expelled. If your college doesn't have an Honor Code, help create one! In an era of missing ethics, colleges are an ideal place for people to learn the importance of honor.